I, like so many other Americans, grew up with a Weber Grill in the backyard. The memories for me, started at a young age. My father restores antique period furniture for a living and is excellent at building things. My earliest memory of grilling goes back a few decades. My father built a nice wood table, cut 2 holes in the top and dropped 2 kettles in it. I have great memories of grilling and hanging out at home. We still do it to this day. That table has seen its day but we’ve made sure to put a couple nice Weber’s on my Dad’s patio for him to entertain with. I found my love for cooking at a very young age; Right around 10 or 11 if I remember correct. I was the guy in Boy Scouts who had to do all the cooking. I wasn’t much for washing the dishes but cooking I loved. The summer camp I went to used large rectangular box grills with a door on the front that we called “Sheep Burners”. It took forever to heat up but when you did it ripped for hours. There was a silo that came off the back to pump the smoke into the air and off it went. Growing up in a large family, food and entertainment has rubbed off on me to this day. I love having people over but even more I love grilling. I am working on passing these traditions down to my son, who loves to eat more than he does cook. He’s still young so we have time. Last year, I brought him home his first Weber. 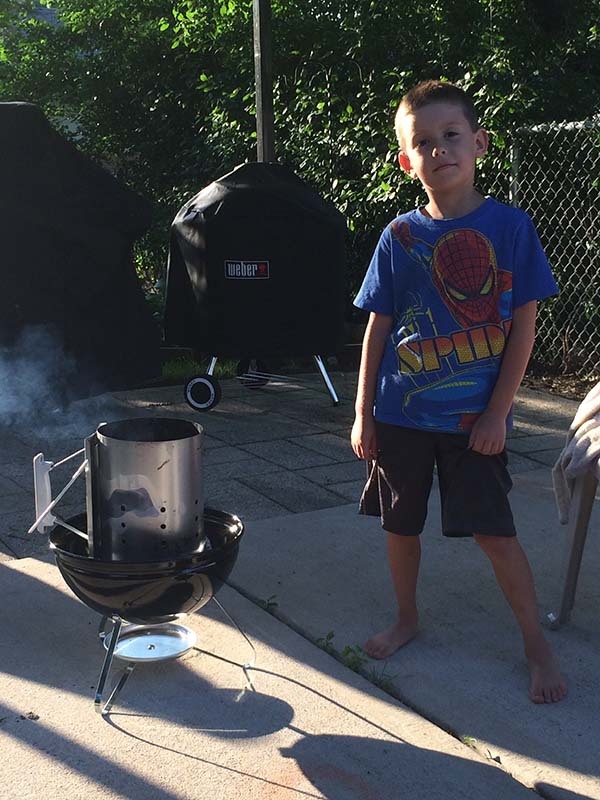 He’s young and a smaller kid so we started with a Smokey Joe. He was super excited! That night we fired it up and cooked some burgers on it for the family. Grilling has always been a pillar and staple in my family and I hope what my father passed down to me, I can pass down to my son. Cooking on a Weber Grill is not just about cooking. It’s about enjoying yourself and making memories. To all the Fathers out there, Happy Fathers Day!! Now go out and make some memories!! Is Your Propane Tank Up To Date?